As this can work on phone signal..? 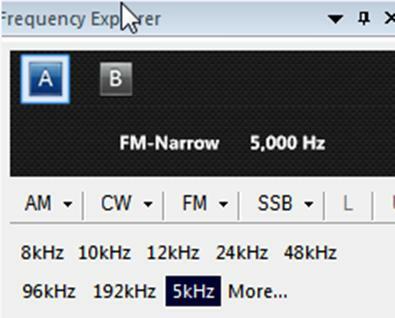 Having a key v3, I wanted to know how much should be set the Frequency Correction (ppm) on SDRSHARP? …… thanks. The V3 has a TCXO, so it does not require PPM adjustment. At most the PPM will be out by 1 or 2. Will this dongle and the included antenna works for AIS Tracking?? Are you referring to our RTL-SDR V3 dongle? If so, yes it will work for AIS – assuming there are actually AIS signals strong enough to receive in your local RF environment. Yup your dongle, how does it compare to the Nooelec nesdr smart? The V3 has a few extra features and benefits over dongles from other manufacturers. There’s a nice image at https://www.rtl-sdr.com/store that shows all the changes and improvements. 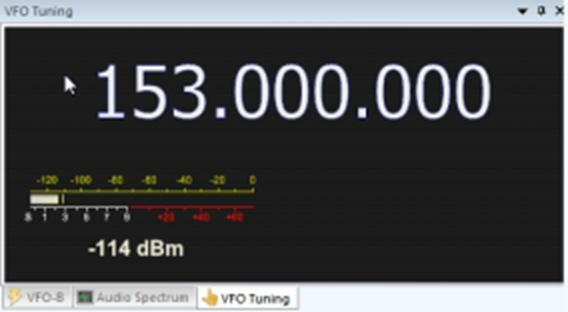 Any RTL-SDR will work, just some likes ours offer better performance and more features. So trunking can work with any RTL-SDR, but it’s highly preferable to use one with a TCXO to avoid drift. Yes but without the TCXO you’ll need to carefully adjust the PPM offset, and worry about thermal drift of the PPM. I have an RTL-SDR v3 key, I wanted to ask, but is it normal that it warms up? … what happens to you? It’s normal to get warm, even hot. But do note if it’s exceptionally hot and loosing USB connection as it could be faulty. Got my rtl-sdr in the mail today. Ubuntu 17.10 on an old Dell. lsusb found the stick, package manager did the rest! Easiest install of new hardware I’ve had in a while. Now for the real fun! Cheers! This doesn’t work. Do you think you could give directions that work? I have followed these instructions below and purchased the recommended book and neither work! How frustrating I can’t get to add radio rtl sdr(usb) to show up. Windows 10. Try SDR-Console V3 instead of V2 which was just recently released. That should come with the RTL-SDR drivers built into it. We’ll be updating the instructions in a few days once we’ve seen more people using it, but I do think that the current instructions for V2 are still valid. SDR Console??????? I believe the drivers are in V3 by what I have seen. Not sure what you mean by SDR Console V3, I have been setting this up via Linux. Jeff, I think you’re reading the wrong comment. That comment was a reply to Charlie’s comment above. I’ve replied to your duplicate comment on the other post. Right, I have received my V3 dongle, which will be used in a Raspberry PI3 B+ unit, for ADS-B tracking with 1090 dump mutability. Now I realise I have to set up the dongle first, now do I have to use the Linux setup, as it will be used in a linux system, or can I set it up with my windows 10 pc, then plug it into the PI3????? Jeff – the dongle doesn’t need any hardware setup besides the drivers needed to run it. If your Pi3 is running Ubuntu follow the Ubuntu instructions closely and its a piece of cake. At this time i thank you gents for the help. I got my sample of SDR last night and it will remain that way. 7. In the folder where you extracted the sdrsharp files find the file called zadig.exe. Right click this file and select “Run as administrator”. zadig.exe Does NOT exist in this folder? Now what? 3rd dongle in two months, two in the trash, have NOT made one work yet. Being my third SDR,(None worked yet) this one has been plugged in for six hours, barley warm. Of course it is not working either. How come someone does not burn an install disk? you know, like the REST of the world !? Did you go through step 5? That is the step that downloads zadig.exe. We can’t give an install disk due to SW licencing issues. The dongles will stay cool while not in operation. Last night i started at step 5, carefully, and it FINELY worked. <Thank You. Lost power, Pc shutdown, Iv no idea how to turn this SDR on? You must not have seen my other post where I explained that the module was frying itself at 227 degrees 10 minutes after plugging it in. What’s the point of it staying cool when not in operation? Doesn’t seem to be the case with this dongle. I wasn’t using it, only plugged it in, and it was burning up in 10 min. Another one is on the way. Also posted that I had downloaded zadig but it still didn’t provide an option to select what instructions said would be there. We’ll see what happens when I get new dongle. I had the same problem, but Ronald posted the website to download zadig. Maybe you’ll have better luck, but, when I downloaded zadig this past weekend, after launching it, it did not provide me the options that the directions required. Hope it works for you. Another dongle is on the way for me; so, I’m going to uninstall everything and reinstall everything with the new dongle when shows up. Best wishes for success! SDR#. When I ran it, it opened, and I selected the SDR-RTL (USB). When I clicked on the cog to Configure Source, there was “E4000” listed to the right from “Device”. There was no device listed nor selectable. I have an RTL2832U R802T2 TCXO+BIAS T+HF. This happens whether in a USB 2 or USB 3 port. What’s not loaded or toggled? I see nothing in SDR# as far as freqs obviously. Got thoughts? Kevin , run zadig.exe as administrator. Select Bulk interface 0 only….unless you see an rtl2832HIR. Restart sdr#. If this works you may have to perform this each time you plug the dongle a different usb port…use usb2 only. Hmmm, I switched the dongle to a USB 2 port, and the dongle appears to be getting very hot. I’ll have to go get my IR thermometer later to check that out. Also, I went back into zadig to double-check, and there now is no option to select “Select Bulk interface 0 only”. I tried going back into the folder where I had zadig loaded and got the same results. I launched as an administrator, selected all devices, deselected ignore hubs or composite parents, went to select “Select Bulk interface 0”, but it’s no longer selectable. FYI, that dongle got so hot to the touch, I had to pull it out. It’s screaming hot. Bad dongle maybe? Got additional thoughts? FYI, checked the dongle’s temperature. It started at 96 degrees Fahrenheit and ramped to 227 degrees F in 10 minutes. Hot enough to boil water; so I pulled it out. I decided not to see if it would glow red if I left it in. Sure doesn’t seem right to me. Anyone have thoughts? Thanks! Hi Kevin, it sounds like this fault from our trouble shooting guide. Please contact us ([email protected]), or via Amazon if you purchased from there are i’ll be more than happy to issue a replacement. My dongle gets extremely hot and stops working, or doesn’t work at all. USB current measures well above 0.3A. Well, I just received the new dongle, which, thankfully is staying much cooler. However, when attempting to set the configuration clicking on the cog, the device showed is “E4000”–not “R820T”., and it’s greyed out and not selectable to change to the RTL-SDL hardware. Followed the instructions to a t; so, someone got an idea? Thanks! 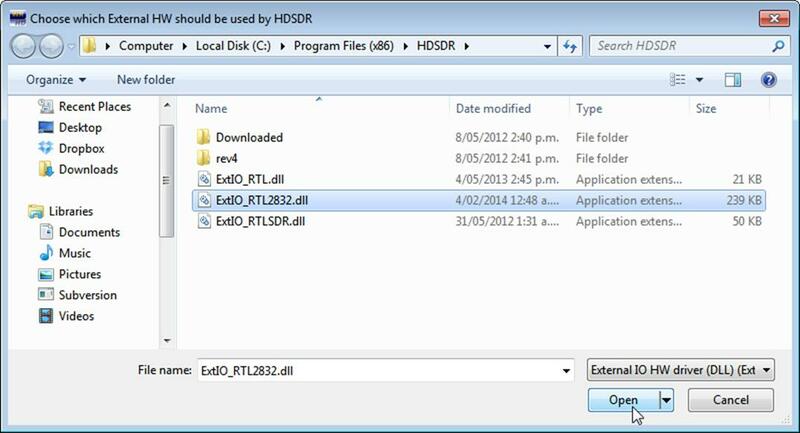 Can you double check if rtlsdr.dll is in the SDR# folder? That’s interesting, it’s not. Where do I find that; so I can download it into the folder. Hmmm, found it on sourceforge, and copied into the SDR# folder on my desktop. Unfortunately, the “E4000” remains with the configuration source being greyed out and unselectable. Should I have done something different? Thanks! After that it should be no problem and the configuration source should be working now. Wel, the best laid plans of mice and men was to bring the computer into work with me so I could work on it over lunch, but I left it nicely bundled on the kitchen island. Hrumph! Guess I get to play with that later tonight when I get home. I’ll let you know. You can have it for postage, im not going to be needing it. SDR#. When I ran it, it opened, and I selected the SDR-RTL (USB). When I clicked on the cog to Configure Source, there was “E4000” listed to the right from “Device”. There was no device listed nor selectable. I have an RTL2832U R802T2 TCXO+BIAS T+HF. This happens whether in a USB 2 or USB 3 port. What’s not loaded or toggled. I see nothing in SDR# as far as freqs obviously. Got thoughts? Make sure you follow the instructions on using Zadig. This sets up the proper driver for the sdr dongle. Help, I accidentally overwrote the driver for USB Receiver (Interface 0) just like you warned against. I went to device manager to update the driver for (interface 0) and it tells me the driver is up to date. How do i get the original driver back for the USB Receiver (interface 0) – my keyboard no longer works. Go into device manager and find the entry that you overwrote for your keyboard. 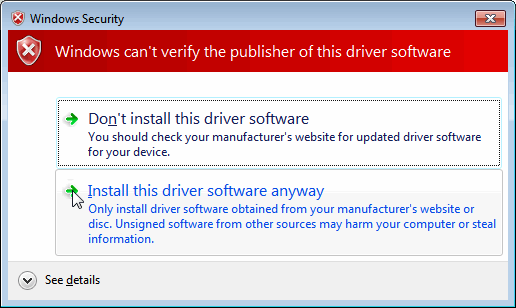 Right click the device -> Update Driver -> Browse my computer for driver software -> Let me pick from a list of available drivers on my computer. Now you should be able to choose the previous driver. Click next and it will revert back to the proper driver. 1. Followed the Quick Start Guide for my Windows 10 desktop. Everything went exactly as the guide described, and the installation completed without difficulty. 2. THIS IS THE COOLEST THING EVAR!!! And, now the fun and the learning begins! Thanks for making the entry into SDR so inexpensive and painless. While trying to play from RTL2832 I get a message “No audio playback device found” and it just stops there. I am running this on Windows 7 SP1, 64bit. I have the latest .NET4.7 installed. The winusb driver is assigned to bulk interface 0 and bulk interface 1 is not assigned any driver. Please advise and thank you for your help. 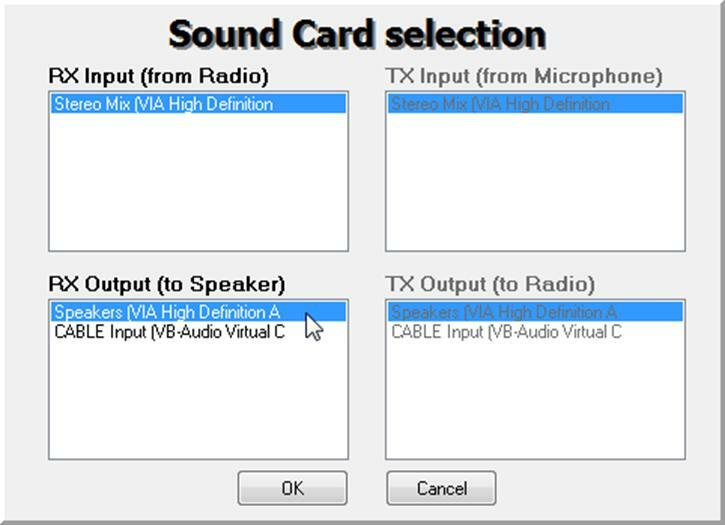 This error isn’t related to the SDR, but it usually means that there is a problem with your soundcard drivers. Try updating them, and ensuring that the speakers are working correctly. Has anyone used the latest dongle (as of Jan 2018) with Chrome OS? My BAD! Just noticed that there is software mentioned on another page on this website that is specifically for Chrome OS. Just for others who may be wondering: the “Radio Receiver” app for Chrome OS listed on the rtl-sdr software page is no longer fully supported and the developer, Jacobo, tells me that he hasn’t worked on it for a couple of years. He was very responsive to the issues I had (although he didn’t have a solution for one of them) so one shouldn’t expect too much in the future. There was also a thread last year on reddit where someone was trying to find out if anyone would take over development and maintenance of the app; no takers so far. The RTL SDR dongle (version 3) I just purchased is working great for VHF and UHF and also direct sampling HF including the ham bands. 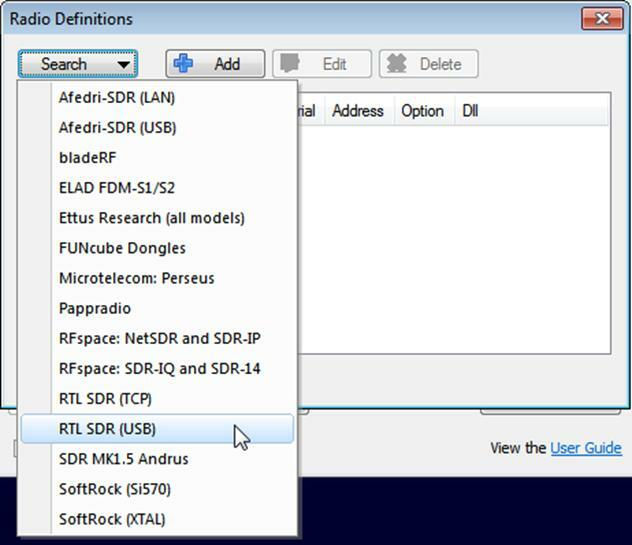 Using SDR# per the quick start guide. Did try TV reception and installed the Realtek drivers and tried several TV software packages including the recommended Prog-DVB, but received various error messages (dongle not started or greyed out or “x”ed out) so reception was not possible. Any suggestions? Thanks, ham Keith in Utah. Double check that Windows is not instantly overwriting the TV drivers with it’s own broken ones. Some versions of Windows do this which is very frustrating. It can be avoided by turning off Windows automatic driver updates. Is the V3 working as direct sampling on Android yet. 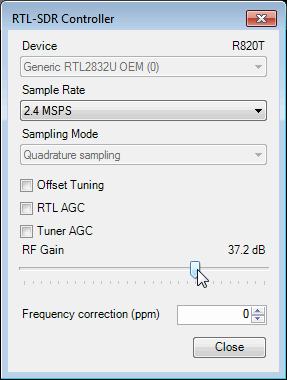 I can’t find out how to do direct sampling with V3 and Android with the SDR driver? It’s working on SDRTouch. There is an option in the settings. Not sure about the drivers directly, but there’s probably a flag for it on Android. It works. Many thanks. I shall be using this to trace local electrical noise that radiates from any electrical gadgets around the house and neighbours, which interferes with 80 Metres and other amateur radio bands. Many thanks. Hello – I just tried a new RTL-SDR dongle on an Android device and SDRTouch. It received FM broadcast just fine, but a preliminary check of the AM broadcast band and the 75M amateur radio area revealed no signals – just background noise – with a resonant, known-good antenna. Is there something I missed? Since we are reloading the USB driver in windows installations, does this make the usb port unusable for anyother devices such as flash drives? Getting at, does the PC have to dedicated to rtl-sdr use or can it function as a standard PC yet? No all other devices will still be usable on the USB port. 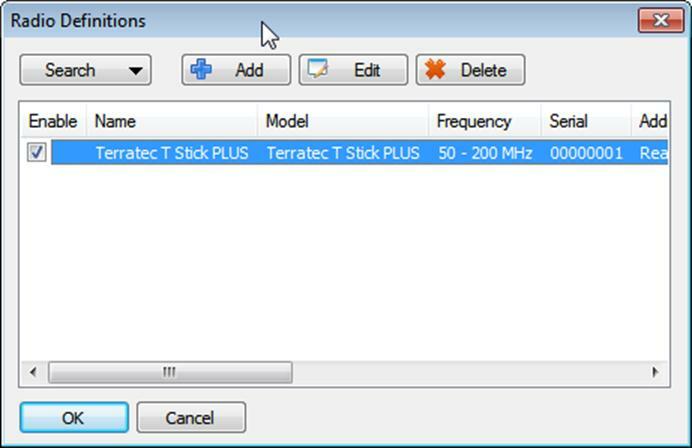 You don’t need to dedicate an entire PC to RTL-SDR, you can still use it as a standard PC. 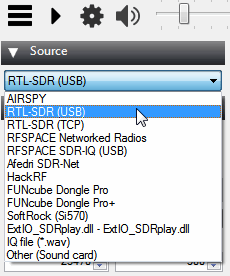 The RTL-SDR just acts like any other USB device, just that you need to manually install the WinUSB drivers for it. When I run SDR# (v.1.0.0.1583 – RTL-SDR (USB)) I get “No device selected”. Going to settings The Device is shown as E4000, the drop down is greyed out (I’m trying to select Generic RTL2832U OEM (0)). I’m using the ADAFruit P1497 SDR USB dongle. Using Zadig I was able to get Bulk-In, Interface (Interface 0) to use the WinUSB (v6.1.7600.16385) driver. I uninstalled Interface 1. Any suggestions on how to proceed? (yes, rtlsdr.dll file is in the correct location and the director i not set to read only). contact ADAFruit for support ? Have you gone through every single step of the rtl-sdr dongle setup guide, it should work for a generic stick with the RTL2832 chip in it. Looking at the SDRSharp.exe.Config file I see that is empty. I have got the software and dongle working just fine for receiving FM radio but would like to monitor some of the VHF and UHF ham radio frequencies. I see very strong signals on the frequencies in question but not gleaning any intelligence. The frequencies in question are, for instance, 146.52 and 446.0. The mode would be, by my lights, Narrow band FM. Any thoughts? +10 for the guide! Simple to follow, quick working install. Is this because my existing dongle is not compatible ? Can get DLL bat file error while retrieving files? When i installed the dongle it appered as a wireless keyboard? I follow instructions to install SDRSharp. When I double click on SDRsharp.exe file nothing happen. Program does not start. Please advise me how to fix it and install SDRSharp. May 24, 2017 - 12:36 am Miguel G.
You can’t, but you can use the breakout pads on the PCB, and the clock selector headers to attach your own NTP or GPS disciplined oscillators. All works great for Win 10 x64, then step 12 (run sdrsharp.exe) just does nothing. No GUI opens, no errors on the screen. Just nothing. Uh… help? Has anybody seen this? Me too. It does leave a crash.txt file in the directory the program was run from. I suppose the stuff in the file will mean something to the programmer. Anonymous, try downloading the first choice on the page, Windows SDR Software Package. Thats what I did after the x64 failure, and it installed and works OK. Remember the part about running as admin. I followed your guide and had it up and running in about 30 mins. Seems to be receiving find but I’m not getting anything in the Ham Bands. Am I doing something wrong. Also is there a way to directly input a freq instead of digit by digit? Are you using a V3? 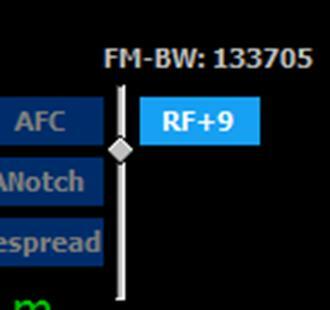 Remember that for the HF ham bands you need to enable the direct sampling mode. See the V3 users guide linked in this quickstart guide above. Got it up and running on sdrsharp on Win 7 x64 for the most part.. Seems to be receiving fine for the most part on the UV side with the small antenna that came with it.. I have the HF side connected to my Multiband windom outside.. But do not get anything on any of the ham bands.. in any mode.. Am I missing something? I have played with the Rf settings from 0 all the way to max and still get nothing..
. Stop the reciever first or the option won’t appear. Where i can download SDRSharp version 1533? There is nowhere to find archive of old revs of program! I’ve loaded all of the SDR drivers; SDR Sharp and RTL1090 are all functional (even the scope on the beta version is working). However, I’m trying to use ADS-B Scope along with this to track aircraft. I loaded the maps and set our location, but the aircraft don’t appear on the ADS-B Scope map. Do you know of a solution for this? Hello! I have the NooElect NESDR SMArt – Premium 0.5PPM TCXO and I’m going to be trying to use it with OSX El Captain. So far I have HDSDR up and running and have a nice waterfall with no ability to hear anything but background static, I have the three stock antennas that came with the dongle which I don’t expect much from, but I am hoping to at least verify I don’t have a bad SDR dongle. Any input on things to try would be appreciated. Thanks! 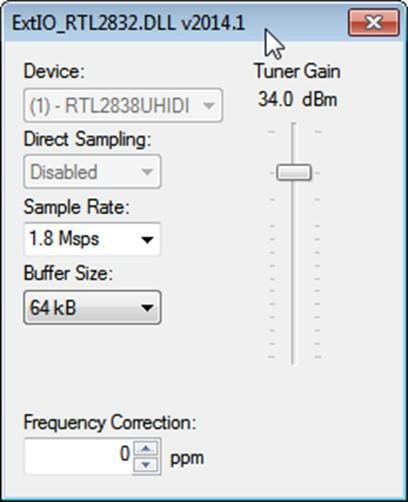 I had my new RTl-SDR.COM V.3 dongle today, but I have problem with Zadig: when I insert the dongle in my PC and select Built-In, Interface (Interface 0) in the Driver I have (NONE) only: what I wrong? No problem with my old R820T Newsky dongle. The box on the left shows the CURRENTLY installed driver. The box to the right of the green arrow shows the driver that WILL be installed after clicking on install. Depending on the configuration of your OS, some versions of Windows install DVB-T TV drivers via plug and play as soon as you plug the device in. Often it won’t install anything, hence NONE for the current driver. It seems in your case nothing is auto installed. In either case you are okay to go ahead and install the drivers via zadig. After installing WinUSB should be shown on the left current installed driver box. I disabled the automatic driver installing from system. I installed the driver with Zadig and now on the left side of green arrow there is the same WinUSB of the right side. I thought that there should appear the RTL2832U words. In the device management appears Bulk-In, Interface (interface 0) in the Universal Serial Bus devices voice. However, the dongle works now, and is recognized as R820T Generic RTL2832U OEM (0) in SDRSharp, RTL2838UHIDI in HDSDR and EZCAP USB 2.0 RTL2838UHIDIR R820T in SDR Console. Yes that is correct now. Remember the left of the arrow shows the currently installed driver, and you want the WinUSB drivers to be installed. Most Windows systems will install a generic DVB-T driver when you plug it in, so those will show RTL2832 on in the before box, before WinUSB is installed. Some systems for whatever reason don’t install anything automatically, and so will show NONE. January 20, 2017 - 11:06 pm Ken_S. 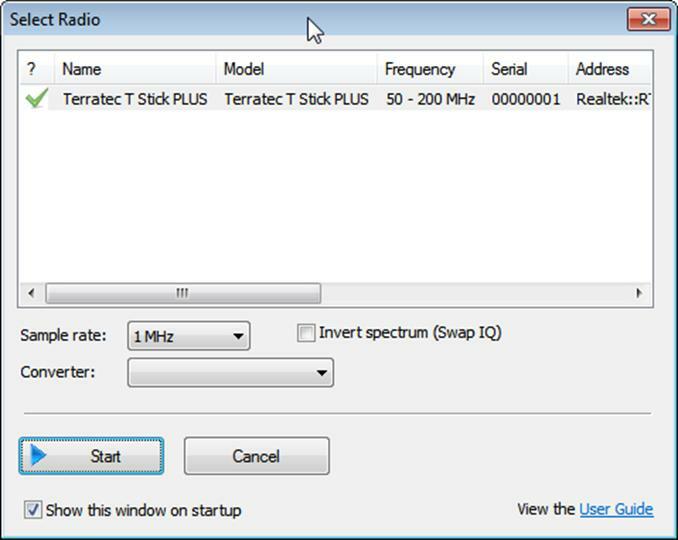 I just bought rtl-sdr but it doesn’t work for me. gqrx crashes. Are there any other programs or some more instructions for linux? OK, maybe it works. Where I can find something to check it? What frequency? OK, it works now. Is there a way to listen more then one frequency at the same time? Why is my Dongle SDR deaf as a post? Are you trying to tune below 30mHZ ? 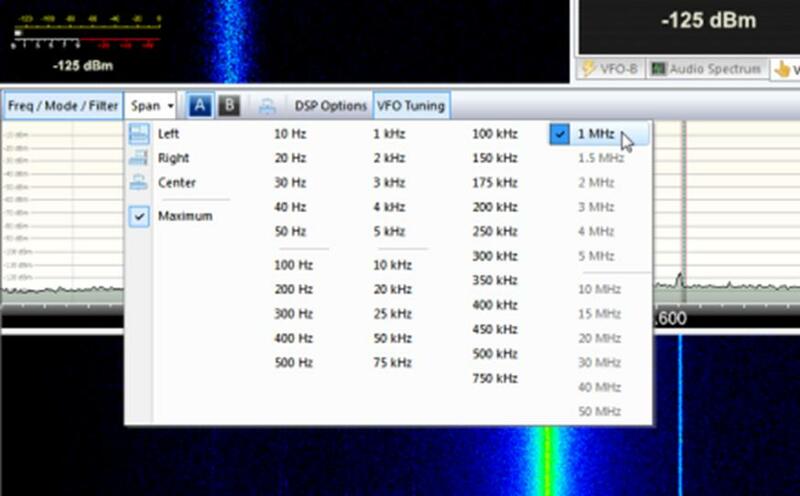 Stop SDR receiver, click on ExtIO, change sampling to Q input, start SDR. Hope this is your issue.